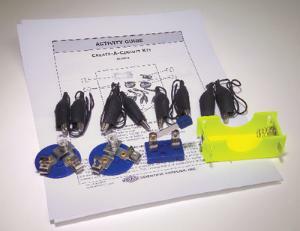 The Create-a-Circuit kit gives teachers a hands-on system for introducing students to circuitry. The kit features a "D" cell battery holder, knife switch, two miniature light bulbs, two lamp holders, and four connector cords. It has everything needed to build a series circuit.